I am Kerstin, a representative of the InstaForex Companу on this topic. I would love to hear comments, opinions and suggestions regarding our services that would certainly help us to develop and improve on this business. Please don't hesitate to ask questions, as I and my colleagues will be glad to assist everybody. Rest assured that any questions will be answered on the best way we can. Happy trading! Yes, Instaforex I like this broker. To learn more about InstaForex First Conference in Moscow 2012, please visit the official website of the company, where you can find the results of the event and a photo report. We would like to draw your attention to InstaForex Company work schedule during Christmas and New Year holidays so that you could plan your trading time according to it. On December 24, 2012 the market will close at 20:00 (UTC + 03). December 25 is a non-working day. On December 26 the market will open at 09:00. The Client Support department will start working from the same time as well. The market will close on December 31, 2012 at 20:00. Client Support will be unavailable as well. January 1, 2013 is a non-working day. The market will open again on January 2 at 09:00. From this time all the departments of the company will start working as usual. In addition, please note that opening orders on exotic currency pairs (Forex Crosses 4 and Forex Crosses 5) will be unavailable from December 24, 2012 to January 4, 2013, but there will be no restrictions to close orders. All the other trading conditions of InstaForex Company remain unchanged. The guests were very interested in company’s booth and asked many questions about innovative broker's services, bonuses and ways of funds replenishment and withdrawal. Every visitor received InstaForex Club card which enables to accumulate bonuses up to 40% for every replenishment. Official program was accompanied by the performances of well-known specialists in the field of market analysis. The guests readily participated in discussions of speakers' reports. InstaForex is Serving Over 1,000,000! InstaForex Company is happy to announce that the number of company’s clients reached a landmark figure! Now more than 1,000,000 clients prefer InstaForex to other companies! Due to our partners and clients’ dedication we always keep abreast of the times. We do everything to make your cooperation with InstaForex comfortable and fruitful. A wide range of services of high-level, trading experts, and individual approach help us to be on top of brokerage services market. Up-to-dated informational technologies, reliability, comfortable and qualified servicing allow InstaForex to create all the necessary conditions for beneficial work of both newcomers and seasoned traders. Success and confidence of our clients are of great importance for InstaForex. That is why we are interested in amicable collaboration based on mutual trust, honesty and commitment to reach the desired goals. To take part in the contest is extremely challenging. Making this decision we think: "What if I win?" and we are eager to participate trying our best. Meanwhile, we should understand that good luck plays a significant role in the process of winning. 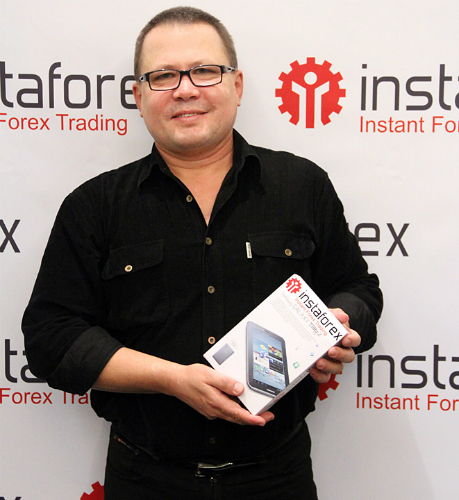 InstaForex Company is pleased to greet award-winning traders and is ready to award the prizes! This contest is for those who love speed and excitement! FX-1 Rally is a fascinating contest full of unpredictability, excitement, and rivalry. Anatoliy Miron demonstrated the best result. He won a $500 prize. InstaForex warmly congratulates Anatoliy on his achievement! Would you like to prove yourself as the quickest trader? Next Friday you can take part in the contest. Register for FX-1 Rally on the registration page. InstaForex Contests are for courageous traders. However, it is pleasant to be among the owners of the title "Lucky Trader". Nikolay Hilko has a good luck today. He is a lucky trader as he won $1,000 prize. Enroll for the next stage of the contest which will take place from December 17, 2012 to December 28, 2012. Registration is available until 23:00 December 16, 2012. Vitali Kotchenko is a winner of the most popular contest among the InstaForex traders. InstaForex Sniper provides the possibility for the traders to compete with the other traders holding demo accounts and get a $500 prize. InstaForex warmly congratulates the winner. Everybody is welcome to take part in the next contest which will be held from December 10, 2012 to December 14, 2012. Registration is available until 23:00 (GMT+3) December 9, 2012.
Who is the owner of the chancy deposit? The campaign is over signifying the name of the winner is known. This week fortune smiled on Jeong Myeong Gyu as he won a $1,000 prize. Next week you can prove yourself and try fortune. Hurry up and register! InstaForex Company is happy to announce the start of a new season of [url="http://instaforex.com/contest_forex_greatrace_2013.php"]InstaForex Great Race[/url], the contest among demo accounts. It is interesting for traders who want both to improve their skills and to get real money from demo trading. 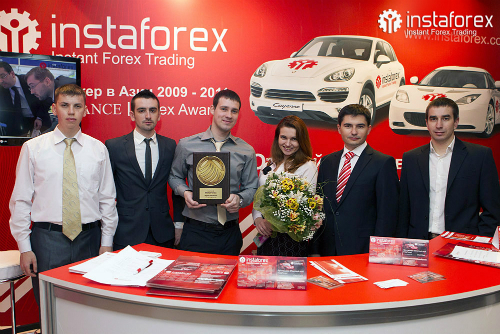 For the five-year history of InstaForex Great Race, tens thousands of traders have registered for the competition. Isn’t it the sheer proof of contest’s popularity? In the fifth season of InstaForex Great Race, the total prize pool reached $55,000. Be ready to get a piece of this pie! Hurry up to register and become a candidate for a part of the prize pool. The registration for the first step will last from December 10, 2012 to February 1, 2013. 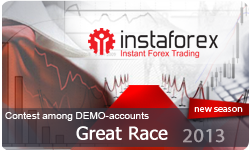 Participate in InstaForex Great Race 2013, raise your professional level and earn money at no risk! Register for the new season of InstaForex Great Race 2013 right now! Take part in InstaForex contests! 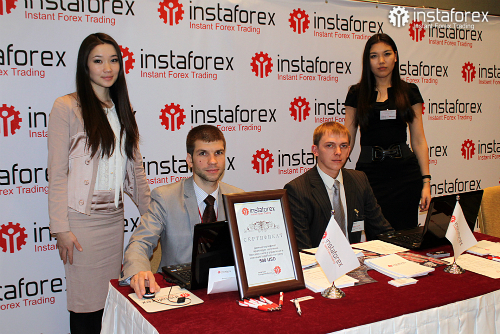 On December 8, 2012 InstaForex Company participated in the financial conference of ShowFX World held in Almaty, Kazakhstan. This type of event was held in the Southern Capital, however, the number of visitors and participants could be compared to that recorded for the largest conferences arranged by the exhibition brand ShowFX World. The conference was attended by professional traders of the currency market as well as by newbies. The representatives of InstaForex were pleased to meet and to communicate with the active and potential customers of the company, sharing the latest innovations on Forex. A lively atmosphere was observed all day long. Moreover, a particular interest was evoked by the speeches of specially invited analysts from the InstaForex team: Anatoly Khegay, Olga Dudukalova, Nadezhda Zhizhko, Sergey Belyaev, and Oleg Khmelevskoy, who dwelled upon their experience of working on the currency market as well as answered all questions of guests regarding the subjects of the speeches and the Forex trading theme on the overall. Traditionally, the company arranged a lottery with such prizes as modern devices and money-certificates from InstaForex. The luckiest guests won iPhone, iPad and two $500 certificates. InstaForex is grateful to all visitors, organizers and participants of the event, and hopes that the meeting held in the finance centre of Kazakhstan, has become a start of an annual tradition.